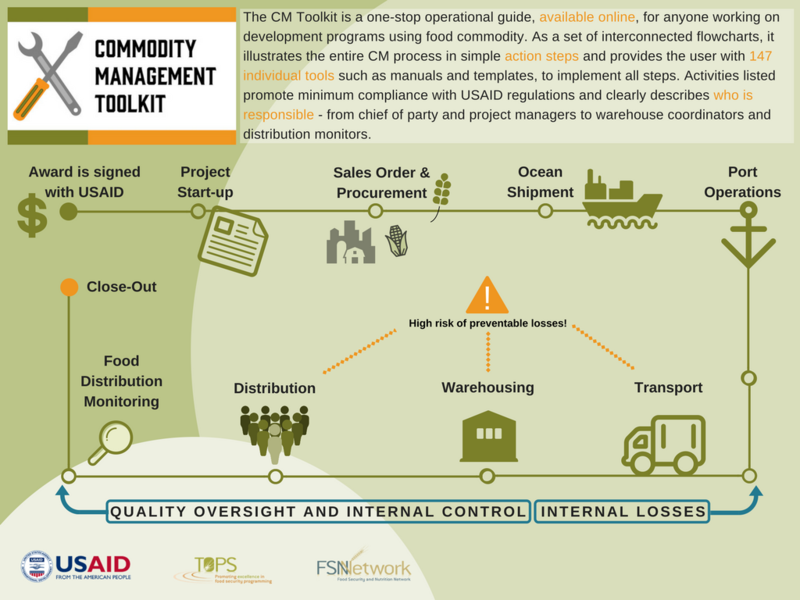 The Commodity Management (CM) Toolkit is a one-step operational guide for anyone working on programs using food commodity. It provides staff quick access to the specific information they need on minimum requirements, whenever and wherever they need it. The toolkit is a set of interconnected flowcharts that provide a road map of the entire CM process - from project start-up through close-out - in simple steps. In addition to illustrating each activity required to promote compliance with USAID regulations - and the functional area(s) accountable - the toolkit provides instant access to 147 tools designed to help users implement these activities. The toolkit can be used both as a self-study training resource for new staff and as a quick reference for more experienced staff. Please ensure you have the most up-to-date version of Adobe Acrobat Reader. Navigation instructions are provided in the first few pages of the toolkit. To access the CM toolkit in English, click the English icon below. Si vous voulez accéder à la version française, cliquez sur l'icône en française ci-dessous. For a quick overview of the toolkit, check out the infographic below! The TOPS Program hosted a launch event for the CM Toolkit. You can access the event recording here. For your convenience, you can download any individual tool (such as checklists, templates, and examples) directly from the list below.